In the past, shiny linen damask used to feature on many dining tables. The table linen and napkins were a standard part of the trousseau of well-to-do, marriageable women. Possessing an extensive linen trousseau was her pride and represented great value. Around the turn of the century in 1900 a number of linen weavers in Brabant – in and near Eindhoven – took the iniative of involving artists to create artistic linen table damask. This exhibition presents an excellent overview of the beautifully designed linen table damask from the first part of the 20th century. This display is one part of a two-part exhibition of artistic linen damask. The other part of the exhibition is called ‘From Arabesk to Swan; linen damask designs by artist Chris Lebeau’. His designs for linen damask (approx. 55) with Art Nouveau style patterns of nature that were created for linen weaver Van Dissel & Zonen in Eindhoven have become very famous. Sanny de Zoete acted as guest curator for this exhibition and is co-author of the book ‘Artistiek damast van Brabantse bodem 1900-1960’ (Artistic damask from Brabant 1900-1960). Opening hours: Tuesdays to Fridays 10.00-17.00 hrs, Saturdays and Sundays 12.00-17.00 hrs. From 15 July until 15 November 2002 the exhibition ‘Beautiful damask, pressed with love’ was on display in Slot Zuylen near Utrecht. Guest curator Sanny de Zoete carefully selected the items that were shown in this exhibition. The dining room table is immaculately covered with 17th century linen damask. Belle van Zuylen’s bed is made with sheets and pillow cases embellished with 18th century bobbin lace. The beds in the guest rooms are inviting and show beautiful hand embroidered 19th century linen sheets and pillow cases. The white linen damask towels are neatly hanging on a towel rail waiting for guests to arrive. The linen that is not used is lying neatly on the shelves, a joy to look at. In short: in the entire castle linen has once been put again where it belongs. Many wonderful sets of table linen damask of the Van Tuyll van Serooskerken family have been kept. This exhibition shows the best examples of four centuries: from naturalist tulips and grapevines to geometric patterns such as stars. The napkins look like half sized table cloths, but they seem tiny compared to the real table cloths that measure from 5 up to 8 metres. Traditionally, linen used to be marked with the family’s initials. The initials TvZ, referring to Tuyll van Zuylen, is very common. But it is exceptional that there are still 86 of the same napkins. All these napkins were embroidered with tiny cross stitches and the number of 86 is on each napkin. You can tell how careful a family treated its table linen by looking at the beautiful stitches used to repair table cloths and napkins. You can also tell when unprofessional hands have repaired the table linen. For the first time in the history of Slot Zuylen a family washes its dirty linen in public! Visitors of the exhibition will find out about the meaning of the expression ‘to mangle someone’ because the massive, heavy mangle is rolling again, pressing the linen of the castle just like it has done for centuries. Young children would love to go for a ride on the mangle, just like in the old days. 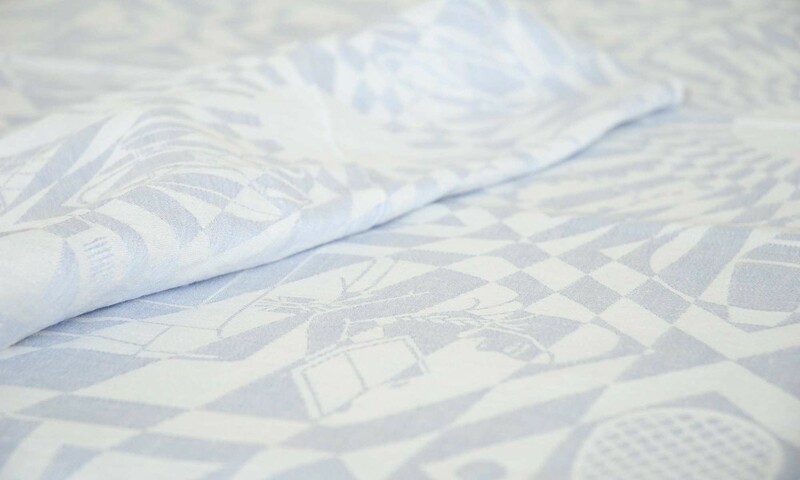 You can hear the unique sound of linen being pressed, creating as if by magic, the wonderful shine on linen damask. In addition, you can actually feel how smooth linen becomes by mangling it. You will also find out all about the meaning of words such as ‘kit napkin’ and ‘sentry box napkin’.